A very special production and likely the most important blues release of the year. 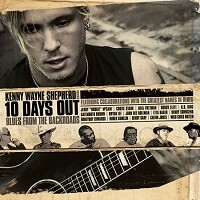 10 Days Out…Blues From The Backroads documents the voyage of blues guitar great Kenny Wayne Shepherd as he travels the country to jam with, interview and generally pay homage to the last of the authentic blues greats. Beginning in New Orleans and ending with a grand finale concert at Acoustic Sounds' own Blue Heaven Studios in Salina, Kansas, Shepherd's pilgrimage is a perfect lens into blues history and with absolutely exceptional cinematography and editing. This is a major-league production about what all too often is treated as a minor-league genre. The guitar-slinger Shepherd, along with the Double Trouble rhythm section of Tommy Shannon and Chris Layton, begins in New Orleans, where they meet with Clarence "Gatemouth Brown" and Bryan Lee. Their tour busses rumble north to Shepherd's hometown of Shreveport where he and Buddy Flett jam at Leadbelly's graveside. They continue on into Mississippi to perform with B.B. King in his hometown of Indianola. Then it's over to Alabama to visit the home of Jerry "Boogie" McCain. The tour continues into rural North Carolina to meet with the Piedmont blues masters Cootie Stark, Neil Pattman, John Dee Holeman and Etta Baker. They turn West to jam with the great Henry Townsend in his St. Louis living room along with Honeyboy Edwards, who came down from Chicago for the session. Finally, the production ends at Blue Heaven Studios in Salina, KS (www.blueheavenstudios.com). There, Kenny performs with surviving members of Muddy Waters' and Howlin' Wolf's bands. The concert included Pinetop Perkins, Bob Margolin, Calvin "Fuzz" Jones, Willie "Big Eyes" Smith, Henry Gray and Hubert Sumlin along with guests Wild Child Butler, Lazy Lester, Jimmy D. Lane, Double Trouble and Noah Hunt. The performances are absolutely legendary and the beauty of the old church sanctuary with a revved up "congregation" is truly something to behold. 10 Days Out... is a no-brainer for any blues fan, but it's also the perfect introduction to the blues. And consider for historic sake that since this filming in June 2004, six of the legends documented within have died, making 10 Days Out... a crucial artifact in all future generations' explorations into such an integral part of American music history. This release includes a CD with music from the artists documented on the DVD. Customer Reviews (5.00 Stars) 7 person(s) rated this product. Thank God Mr. Shepherd did as he did when he did it. Fantastic guitar playing by some of the oldest, most talented fingers ever. The DVD gives faces to the music that my mind hadn't even imagined. Special by any measure. KWS (who I've been following for many years) and his whole team, has given Blues fans and others a real gift of documenting the history of one of America's (USA's) own music...the Blues. This is a cherished addition to my collection and I ordered more for Christmas gifts. The music is great...good to see the more senior Blues players still have that fire! This is a must have if you're a R&R fan, Blues fan or Jazz fan. My Hat's Off to Everyone that had a hand in this production!